Great pics, beautiful car. Welcome back. I sadly have way too many pictures on Photobucket, too many pic-heavy threads on here, and nowhere near enough time or patience to copy over my photos. Great car. Confused on the side markers and interior. This isn't a daytona violett? awesome car. 18x9.5 LM's squared are the perfect LM for this car, very well executed. Appreciate all the comments and reception to the car, gang. It's certaily been a journey (and still a work in progress), but glad to be sharing it with the group! Good eye - I have a 96' TV, thus the side marker confusion. Regarding the interior, that was lifted out of another car. Mine originally came with dove vaders. Hated the way the leather wore on those..
Side note - currently following your build thread on IG; excited to see the next iteration finalize! I think the confusion is from the first page saying it was a 97, had me confused too. Car is looking excellent! 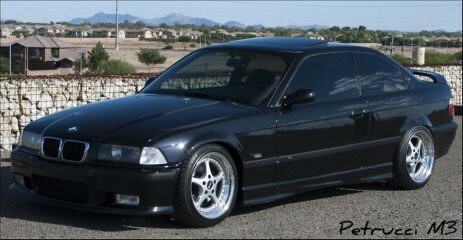 I was wondering where you found a set of 18x9.5 squared LM's that would fit E36 M3, must be another car's fitment. I have the 18x8 et35 but yeah would love 9.5's. Very nice write up and the car looks great! All times are GMT. The time now is 10:47:33 PM.